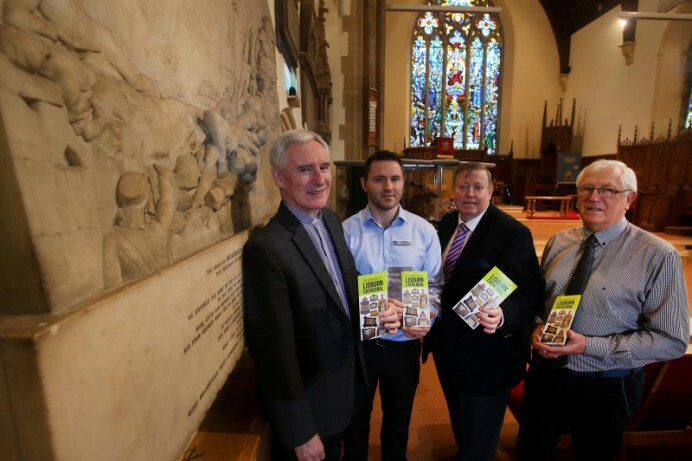 A new guide to the monuments of Christ Church Cathedral, Lisburn, was recently launched by the Dean of Connor, The Very Reverend Sam Wright, and Alderman Paul Porter, Chair of the Council’s Leisure & Community Development Committee. The self-guided tour, a collaboration between the Cathedral and the Museum, tells the stories behind some of the most prominent monuments in the building. Highlights include tablets commemorating notable Lisburn soldiers, military families, local women, Huguenots, and prominent personalities from the landlord and art collector Sir Richard Wallace, to Bishop Jeremy Taylor, and RIC District Inspector Swanzy. The leaflet was launched in Lisburn Cathedral in January 2019. Free copies of the guide are available in Christ Church Cathedral and the Irish Linen Centre & Lisburn Museum.